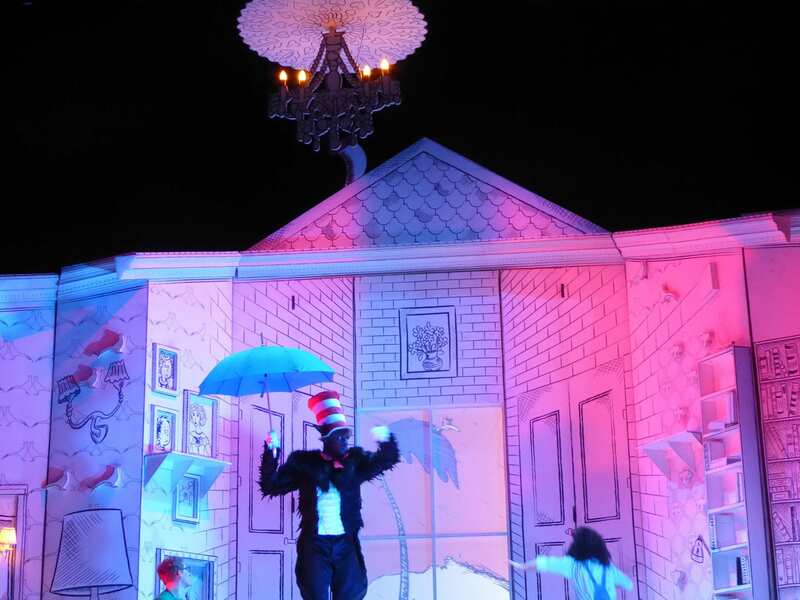 Home » celebrations » Celebrities » children » Circus » Comedy » Comments » Featured Articles » History » music » UK » The Cat in the Hat Show Celebrates Over 60 Years of the Book! When Theodor Seuss Geisel, aka Dr Seuss, wrote and illustrated The Cat in the Hat in 1957, I’m sure he couldn’t have imagined what a popular book it would be! 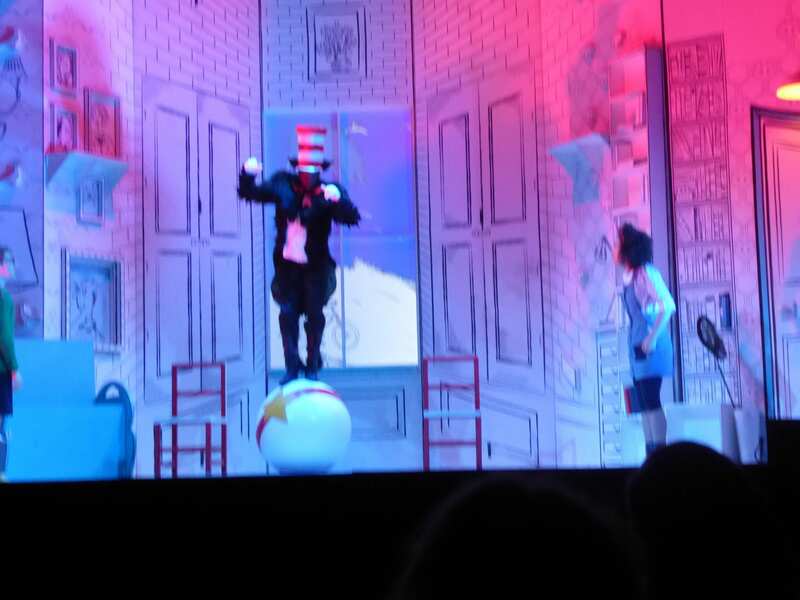 I went to see the stage version of The Cat in the Hat at the Assembly Hall Theatre in Tunbridge Wells. 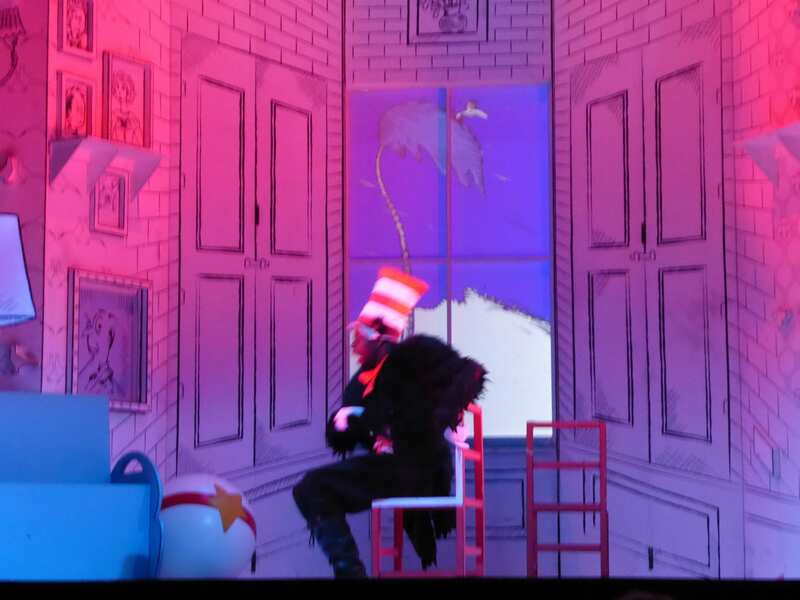 Have you ever read The Cat in the Hat? Of course you have. Everyone’s read it! 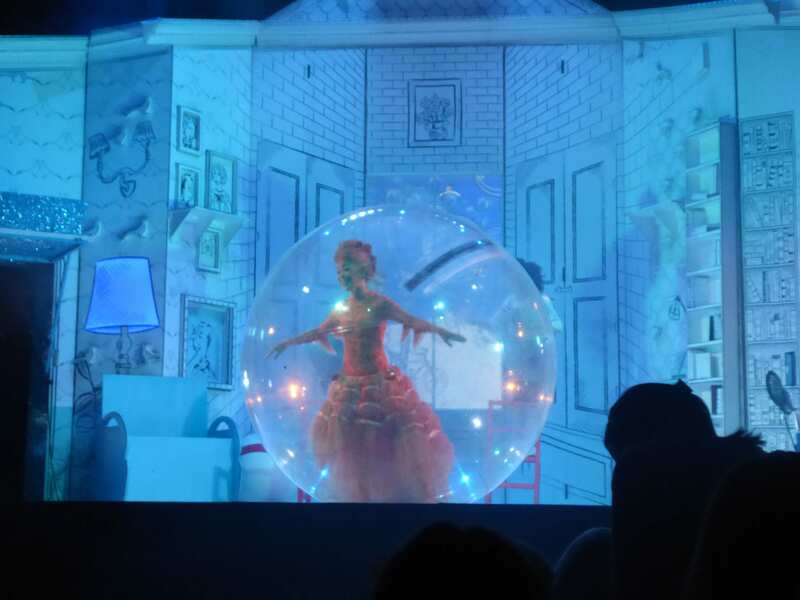 Well it’s hard to imagine, but up there on the stage the pictures come alive from the book! It wasn’t an adaptation; it was It. Cartoon drawings come to life! The cast all have backgrounds as gymnasts and acrobats, and they leaped and capered up and down and over the scenery as though they know things about the force of gravity that we mere mortals don’t! There are only six of them but they filled the stage – and sometimes a lot of the audience too – from start to finish. They never stopped moving! If you don’t know, or have forgotten the story, two bored children, called Sally and her brother Boy, are left alone at home. 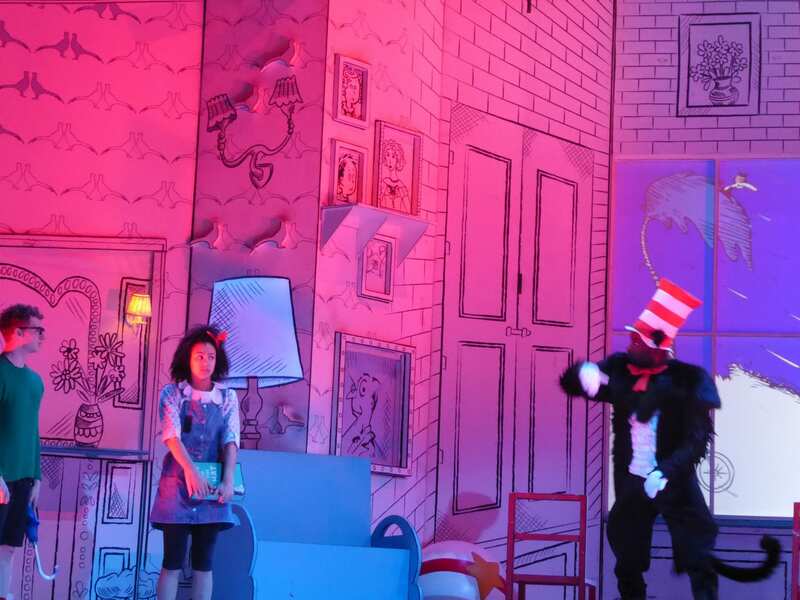 Suddenly the Cat in the Hat appears at their door and creates havoc! 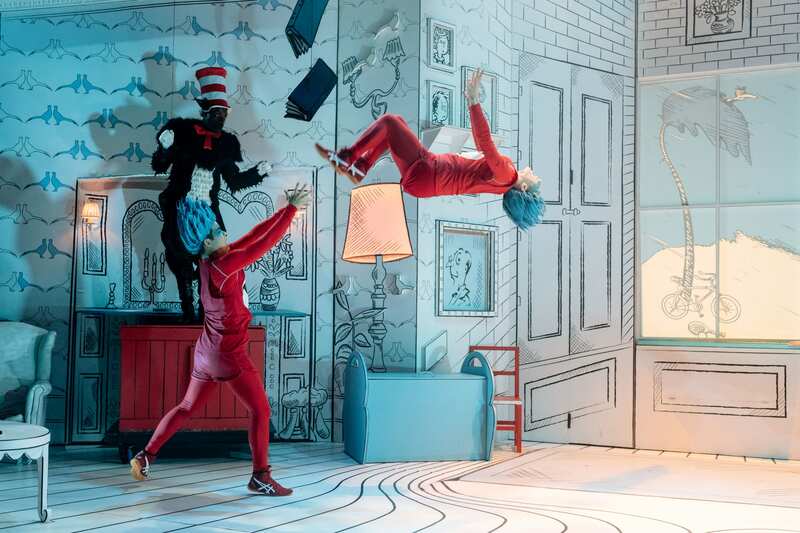 Then his two companions Thing 1 and Thing 2 appear and join in the chaos. But it’s all tidied up before Mother comes home. 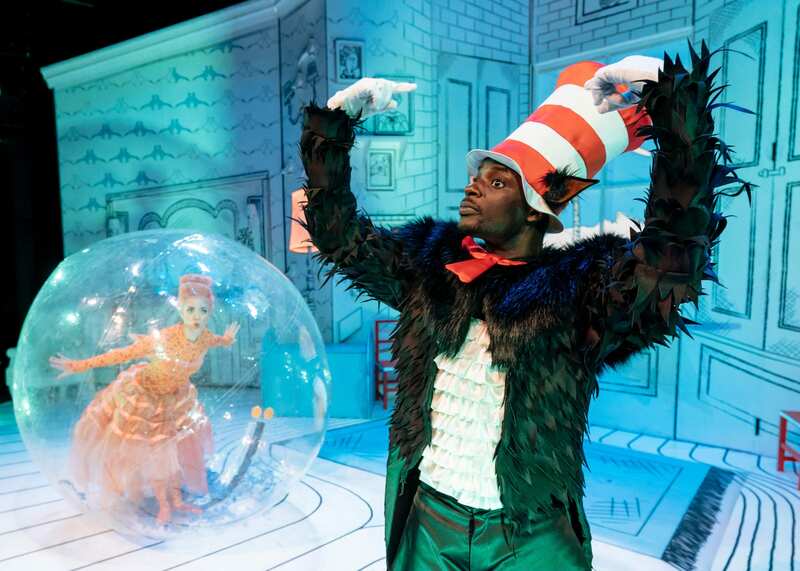 Nana Amoo-Gottfried, who trained at LAMDA, was born to play the Cat in the Hat. He’s purrrrfect in the part, (sorry about that!) and an amazing balancer. Melissa Lowe (Sally) and Sam Angell (just called Boy) are a very convincing pair of bored children. Celia Francis (Thing 1) was a three times British Team Gymnastics Gold Medallist. She teaches at the Pineapple Dance Studios and Studio 68. Robert Penny is Thing 2. He’s an actor and circus artist. He performed as an acrobat in Poldark. And not forgetting Charley Magalit who plays the Fish; yes that’s right, the Fish. She was a lead singer in the Philippine Opera Company. I’m not telling you any more about her part….. The atmosphere in the theatre was animated (a fitting description.) The children all loved it and none of them got bored. There was a lot of involvement with the audience and it was great fun listening to some of the comments from the little ones. But I must say, when the audience was taught the moves of some of the songs, it was the Mums who were the most enthusiastic!